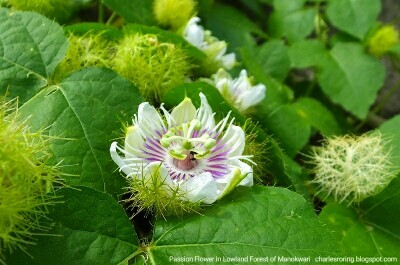 There are several species of passion flowers that I see while I go hiking in the mountainous and lowland regions of New Guinea. 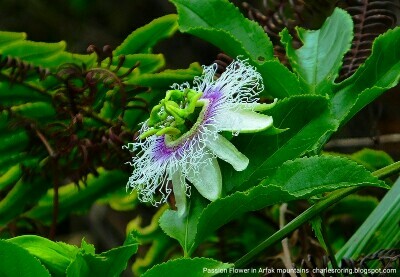 The passion flower in Arfak mountains is larger than the one in lowland area of Manokwari. But the leaves in Arfak are darker green and smaller. Passion fruit from Arfak mountains is very sweet compared to the much smaller passion fruit in lowland. They are definitely two different species. Foreign visitors who go there to enjoy hiking and wildlife watching in the forest like to eat the fruit. I heard from local people that these sweet passion fruit seeds were introduced by Christian missionaries who had brought them other place. The indigenous people who live in Arfak mountains like to grow the vine plant in their garden. When the harvest season comes, they will pick the fruits and sell them in Manokwari city and Ransiki. In Indonesia, passion fruit has been extracted and bottled. The largest manufacturer of passion fruit syrup is located in Makasar city. It is offered to tourists and travelers as a souvenir. In addition to passion flower, there are also a lot of other flowers plants that we could see in the forest of New Guinea such as: Glory Vine (Faradaya splendida), Rhododendron Konori, Rhododendron Laetum, New Guinea Impatient, Hibiscus rosasinensis, Monochoria vaginalis and various kinds of orchids. The best time to see flowers in the rainforest is at the last period of dry season usually in September and October. At that time we could see wild flowers while we go hiking and camping in the jungle. When the flowers bloom, we could see butterflies and birds come to eat their nectars. Birds such as Coconut Lorikeet (Trichoglossus haematodus) and Olive-backed Sunbird (Cinnyris jugularis) prefer flowers in trees to flowers among the grasses.